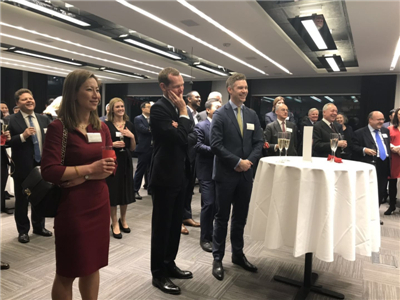 On February 13, Minister Ma Hui attended and addressed the Chinese New Year Reception hosted by Standard Life Aberdeen at the City of London. Sir Douglas Flint CBE, new Chairman of Standard Life Aberdeen, delivered a speech. Over 50 people were present, including Martin Gilbert, Co-Chief Executive of Standard Life Aberdeen, the Rt Hon. Mark Field MP, FCO Minister of State for Asia and the Pacific, Eric Bruce, Client Director APAC & China at Aberdeen Standard Investments, Lord Sassoon FCA, Chairman of China-Britain Business Council (CBBC), David Sayer, Vice Chairman in Financial Service at KPMG, Sherry Madera, Special Adviser for Asia of City of London Corporation, Nikhil Rathi, Chief Executive Officer of London Stock Exchange plc and people from British government, industry and business sectors, as well as heads of the People's Bank of China Representative Office for Europe, Bank of China and other Chinese institutions in the UK. Minister Ma noted that in recent days, the Chinese New Year is celebrated across the UK, and it is increasingly becoming a festival for both the Chinese and British people and an important platform to strengthen ties, enhance understanding, and promote cooperation, culture exchanges and mutual learning. On the occasion of bidding farewell to the old and ushering in the new, a lot of attention has been paid to the state of China’s economy and the prospects of China-UK relations. Ambassador Liu Xiaoming shared his views, using four key words on the current economic situation of China at the HSBC Chinese New Year Luncheon on Feb 12, namely “Healthy, Strong, Bonus and Cooperative”. In his speech at the Conservative China Group House of Commons Breakfast, the Ambassador proposed three crucial choices on promoting China-UK relations. That is, China and the UK should choose win-win cooperation over Cold-War mentality, open cooperation over closedness and inclusiveness over “zero-sum game”. 2019 marks the 70th anniversary of the founding of the People’s Republic and the crucial year to fulfill the first centenary goal of building a moderately prosperous society in all respects. China will continue to deepen reform, expand opening up, improve its business investment environment and promote the construction of the Belt and Road Initiative. 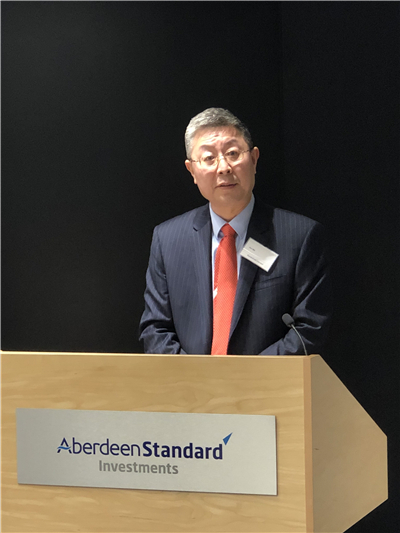 China’s economy is projected to grow healthily and steadily with continuous expansion of China’s mid-income group and scale of consumer market, which will create important opportunities for the development of British companies in China including Standard Life Aberdeen. The UK has long upheld free trade and kept its door open. Minister Ma hoped that Britain would provide a fair, transparent and non-discriminatory business environment for Chinese companies in the UK. 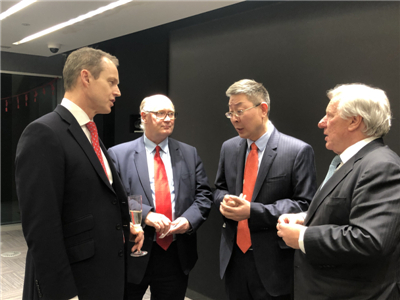 Sir Douglas said that it is the first time that Standard Life Aberdeen held a Chinese New Year Reception, hoping that the Year of the Pig would bring fortune and luck to everyone. China and the UK are playing important roles in promoting economic globalization and free trade. In the context of Brexit, Britain needs to actively carry out the strategy of “global Britain” and build closer relations in economic and trade with China. With the ever-deepening China-UK financial cooperation, Britain is willing to continue to leverage its strengths in financial and professional services to make positive contribution to the Belt and Road Initiative. As a global leading insurance and asset management company, Standard Life Aberdeen, attaching great importance to China and other emerging markets, is willing to deepen cooperation with China. The guests at the reception commended China on its important contribution to the global economic growth, fully recognizing China’s opening up in the financial services sector. They expressed their readiness to seize the important opportunities brought by China’s sustained and steady economic development and China-UK cooperation on the Belt and Road Initiative to expand cooperation with China so as to achieve mutually beneficial and win-win results.